EASY TO USE: Our patented design allows you to use your diaper sprayer on the highest pressure without a splattery mess. Then use the doors to squeeze out the excess water from the diaper before carrying it to your laundry bag. No need to touch the wet, soiled diaper! TOP RATED DESIGN: Our super strong, custom-made clip is designed with an extra wide opening to hold diapers firmly in place. Provides full containment to prevent splatter. At 16", it's tall enough to keep diapers from dipping into toilet water and opens wide enough to allow your hand to spray gussets at full pressure without stretching them out and causing unnecessary wear on elastics. Easy storage in a wetbag means little hands won't have access to dirty parts. SAVES MONEY: This splatter shield has prevented many families from giving up on cloth diapers when their babies started eating solids. No more throwing away money with "flushable" liners that bunch up and don't stay in place. Helps keep cloth diapers cleaner and softer for longer. Keep stink and stains away! You can also use this to spray fleece liners, "accidents" during the potty learning stage, dirty clothes, basically anything you want to pre-wash before tossing in your washing machine! RELIABLE: Our family-run business aims to please and our customer service can't be beat. Our shield is made of a very easy to clean material that is BPA, phthalate and PVC free! 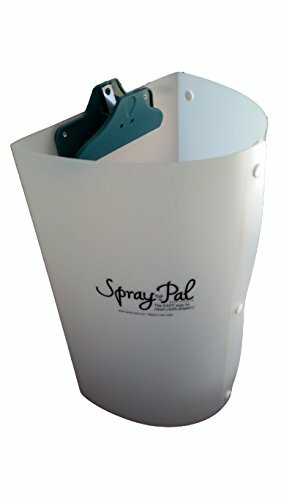 We've made sure your Spray Pal is made of the highest quality materials so that you can use it for multiple kids in diapers and beyond! Can be repurposed for potty training, spraying off soiled clothing from sports, cake smash pictures, stomach bugs and so much more. GREAT GIFT: Makes a perfect baby shower gift for anyone planning on using cloth diapers.